However, I've faced some challenges in notebooking because of my choice to use composition notebooks. I have to resize all of my handouts because composition notebooks are usually 7.5 x 9.75. That's really time consuming when you're in a hurry. I'd love to use spiral notebooks because of the sizing issue, but then I run into the perforated pages that my students just love to tear out. Ugh! It sometimes seems like no matter how good of an idea something is, there's always some type of obstacle to overcome. After four years of looking, I've been presented with the answer to my problems. Yes! 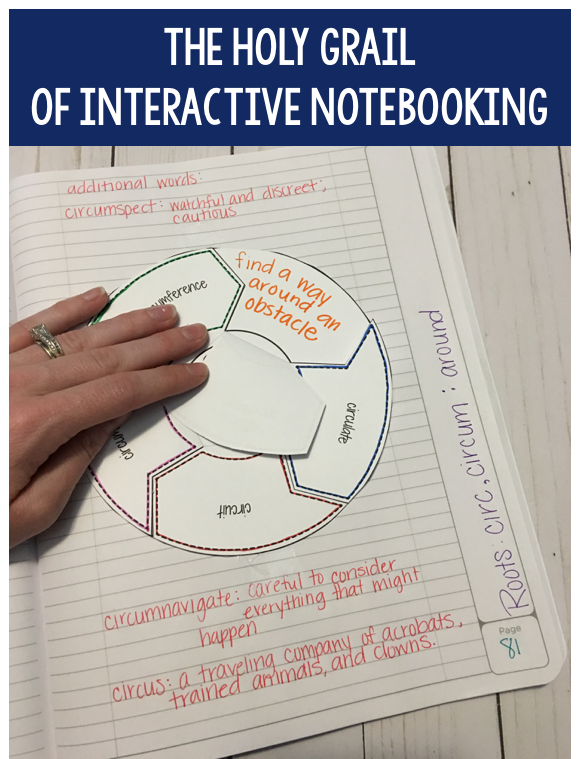 Five Star® Interactive Notebooks, that I've used for years, has released a line of interactive notebooking supplies. I'm so excited to share these with you! These notebooks were designed specifically for interactive notebooking. They really thought this through y'all! These notebooks are going to make interactive notebooking so much easier for us and our students. There are four different options: Five Star® Customizable Interactive Notebook, Five Star® Interactive Notebook, College Ruled, Five Star® Interactive Notebook, Wide Ruled, and Five Star® Customizable Interactive Composition Book. These are seriously awesome. I may or may not have squealed when they came in the mail! Ok, so lets talk about the basic solid color spiral notebooks first: Five Star® Interactive Notebook, Wide Ruled and Five Star® Interactive Notebook, College Ruled. These notebooks come with a nice, sturdy poly cover with an area for a name, subject, and teacher in the top right corner. When you open each of the available notebooks, there is a clear plastic page that has different pockets with closure flaps for students to store manipulatives, or spare pieces, in. I love this since we don't always finish up an assignment in one class period. This is a great place to store those pieces that we'll need later. This also rids us of the need to keep an additional folder on hand at all times. Can you say "thank you"? Yes, please! The next cool part about all of these notebooks is the provided table of contents. It's labeled with a spot for the date, topic/description, and a page number. No more rulers and markers to make a TOC. This comes in handy when it's time to study for finals. Need information on allusions? Check the table of contents. Can't remember how to organize a paragraph? Check the table of contents. See where I'm going? The inside pages are lined with a left and right margin, a title box at the top, and a page number box at the bottom right corner of the page. I really like that this streamlines the notebooking process. I'm all about creativity, but it doesn't do much good for kids to label things if they don't know where they labeled it or where they put the page number for reference. This layout fixes that. The last page in this notebook is a full-size foldout reference page that is gridded front and back. They suggest that this page be used for things like a periodic tables or a glossary of terms. However, I'd probably use mine for all of those things that my kids are constantly searching for: log-in information, passwords, websites we use daily, steps to check their email, and their syllabus. This would be fantastic! I can just hear myself saying, "check your reference foldout." Dream come true! I know what you're thinking though. "Krisanna, you just said that you don't use spiral notebooks because kids tear the pages out." Yes, yes I did say that. BUT...these notebook pages are not perforated, so it's far less likely that kids will just tear a page out hear and there. Problem solved. Another plus? There aren't any holes that students have to write around in the margin. #winning. The Five Star® Customizable Interactive Notebook comes with all of the features listed above, but the front cover has a plastic slip for students to slide in a piece of paper or decorated printout to make it uniquely theirs. It also has a interior pocket on the inside of the cover in addition to the clear pocket pages. The Five Star® Customizable Interactive Composition Book isn't exactly like the other notebooks, but it comes with perks of its own. It still has the table of contents, specific areas on each page for title and page numbers, and an interior pocket. The difference is that this notebook isn't spiral bound. Because of this, there isn't a page of clear pockets and the reference guide doesn't fold out, both of which aren't a deal breaker for me. The game changing moment is now: this composition notebook is 11" x 9 & 1/8", full size! You won't have to shrink your handouts for them to fit. This my friends is a match made in heaven! Y'all, although we're just now finishing up the school year, I've already got this on my must have list for the next school year! I'll be really working with these over the summer to figure out which option I like best, but they've all got great qualities. It's going to be so hard to choose which one is the best fit for my students, but you should definitely add this to your students' list once you're ready to think about next year! You can head over to Five Star's ® Interactive Notetaking website to check out these products and more!